I caught the sunrise once again. 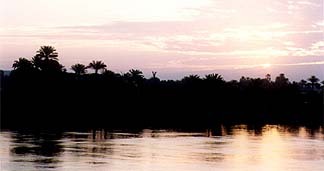 The Nile was beautiful and I would have all morning to contemplate it, as we were not going to reach Kom Ombo before the afternoon. 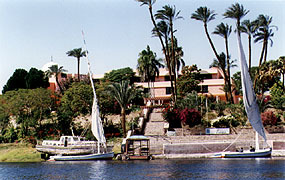 I returned to the long chair where I had napped the previous day, up on the highest deck of the Papyrus, to drink in the sights. The many-faced shores floated by, more or less green, more or less populated, more or less touched by civilization, but never monotonous. 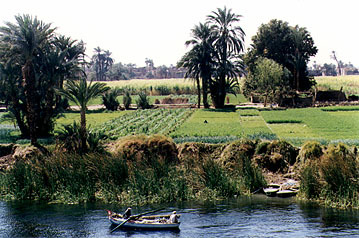 Eventually this perfect morning ended as the Papyrus moored once again at Kom Ombo. 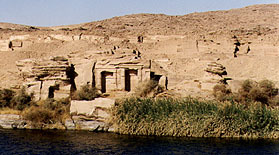 The name means "Hill of Gold", and there stands the Temple of Sobek and Horus. 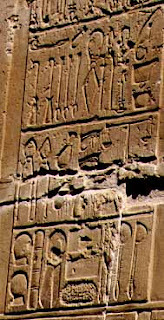 Yes, it is a double temple: as Sobek, the Crocodile God, is rather evil, the builders restored balance by worshipping Aroris ("the Old Horus") in the same temple. 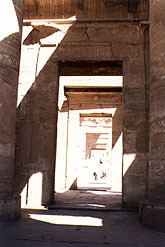 As a result there are two doors (left for Aroris, right for Sobek) for every room or court, even though the rooms and courts themselves are common to both Gods. 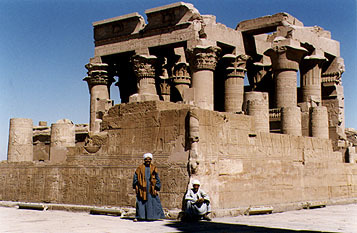 Imhotep is venerated here as well. 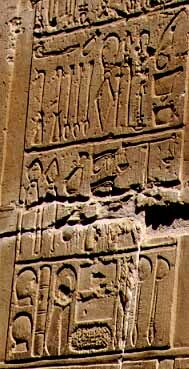 Imhotep was the greatest Egyptian architect, and is mostly known for building the first pyramid, the stepped structure of Saqqara. But he was also a physician, priest, scribe and many other things, and after his death he was deified as a God of Medicine. He is sometimes assimilated to Asclepios, his Greek equivalent. This relief shows us an impressive panoply of medical tools: scissors, sponge, knives, droppers, leeches, spoons, tweezers, scale, tongue sticks... They left little to be invented! The explanation is quite impressive. It was traditional to make an offering of vanquished enemies to Maât, but a symbolical offering. 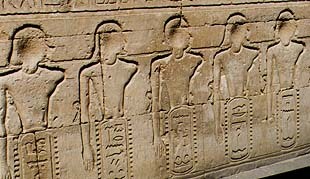 Neither human sacrifice nor slavery were ever practiced in Egypt, and prisoners of war were given freedom and citizenship after a few years of labor. Therefore, the people who came to pray to Maât started by chipping off some rock powder from the face of the prisoner figures in the relief, to offer this powder to the Goddess as a symbolic sacrifice. An interesting motif shows four winged animals: a lion, a bull, a hawk and a snake, who represent the four winds around Shu, God of Air -- or the Air itself. 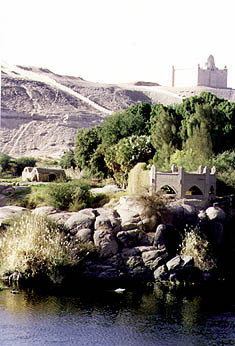 That evening we reached Aswan, marvelous Aswan with its rocks and felucas and many colours, that announces Nubia and the first Cataract... I was compensated from having to leave the Papyrus by the engaging place we'd be staying in for a few days: the Villa Amon on the island of the same name. 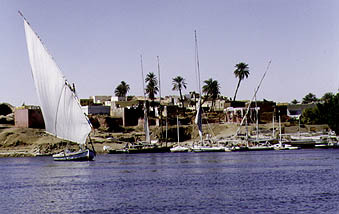 The town is inhabited by a beautiful species of white egret, and by our island was a rock where all the egrets of Aswan come to rest in the evening... Clouds and clouds of chirping birds flocked that way at sunset until the rock glowed white in the darkness. 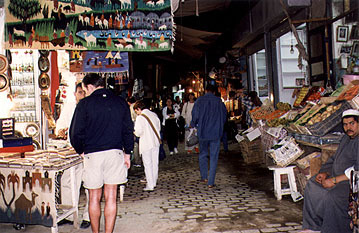 We spent the afternoon in the souks of Aswan. It was very instructive. The Egyptians call all middle-aged men Monsieur Jacques Chirac, and all middle-aged women Bernadette (after Mme Chirac). All women are "gazelles" and all men are "my friend". Touching, but maybe worst of all, all Lebanese are considered wonderful people. Every man I pass spots me as Middle-Eastern , and asks "Morocco? Algeria? ", only to shower me with compliments when I reply I am from Lebanon, "Green Lebanon" as they call it. Ironically we have to speak English to understand each other. Our own languages are mutually barely intelligible.